Russia's art world has been plunged into controversy after an award for innovation went to a giant piece of graffiti that many viewed as obscene. However, art group Voina, their name meaning “war” in Russian, are hardly popular winners. The 65-meter phallus whitewashed on a drawbridge in St. Petersburg, right opposite the Federal Security Service building, is an award-winning piece of art, according to Russia’s Ministry of Culture. The phallus received the 2010 innovation prize and US$15,000 for best visual artwork. The win, however, has evoked more anger than admiration. According to a jury that evaluated Voina’s work, the group won purely on artistic merit. However, for some it is not as simple as that. Some believe that self proclaimed “art terrorists” do not deserve US$15,000 of taxpayers’ money. 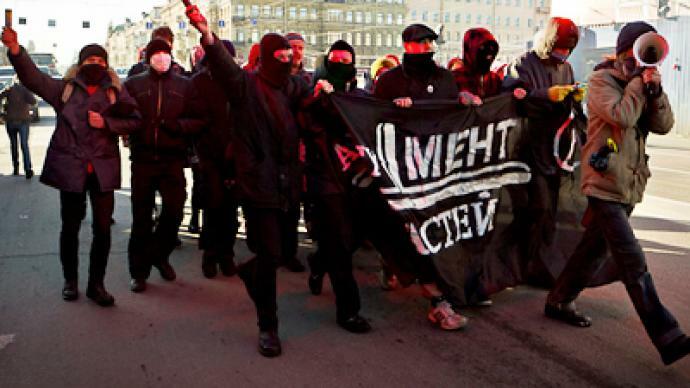 Moscow has recently seen a youth protest against the group’s success with the Ministry of Culture, but there are also those who believe Voina’s gains make sense. However, there has been little acceptance of Voina until now. Two members were arrested for overturning police cars last year, another piece of “performance art”. British graffiti artist Banksy bailed them out, but the pair still face trial on hooliganism charges. So why this sudden show of state support now? However, the latest development comes as a sea change from four years ago. Back then, an image of two kissing policemen was banned by the Ministry of Culture from international exhibits, fearing embarrassment. The curator of that exhibition, Andrey Erofeev, lost his job at the time, but this time he was on the jury evaluating Voina’s stunt. Erofeev added that street art is a minor vandalism, but it is not hooliganism. The Voina court controversy is now going on at the expense of the authorities. Whether it is art or not, they have achieved what they wanted to: notoriety. They say they will donate the prize money to political prisoners.